Three alien planets, among the smallest known, orbit a red dwarf star in a solar system resembling the planet Jupiter and its moons. 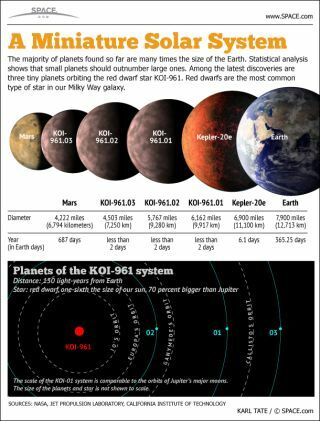 On Jan. 11, 2012, astronomers announced the discovery of a miniature solar system made up of three tiny planets - all of them smaller than Earth - in orbit around the red dwarf star KOI-961 about 130 light-years from Earth. The planets are the smallest alien worlds yet discovered and were found using NASA's Kepler space observatory. See how the small alien planets stack up to our own solar system and Jupiter in the SPACE.com infographic above. Editor's note: This infographic was corrected on Jan. 12, 2012 to include the correct diameter of Mars.